Axelle Lenoir started out as a 2D artist in 1999, for a Quebec City video game company. In 2003, wanting to escape the large production teams in order to get more creative freedom (and because she's a kind of a control freak), she quit and made her first steps in comic books. The Switzerland publisher Paquet published the Mertownville trilogy in the mid-2000s. Since then, Axelle's works were edited by French, Belgian and Canadian publishers. 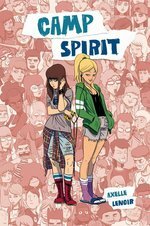 Her most recent series, Camp Spirit (Lounak Books and Top Shelf), is a coming-of-age story about an unlikely friendship between Catherine and Elodie, two summer camp counselors. Axelle's writing style is a mix between humor, everyday life situations, fantasy and comic strips. She likes to write about women, teenagers, folklore, parallel universes and stupid cats. Summer camp is supposed to be about finding nirvana in a rock garden… But Elodie prefers Nirvana and Soundgarden. Can she confront rambunctious kids, confusing feelings, and supernatural horrors all at once?